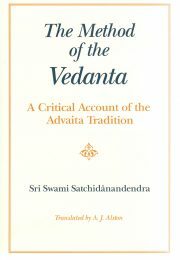 The Method of the Vedanta is a history of the non-dual philosophical tradition, written in Sanskrit by Swami Satchidanandendra (1880-1975), translated into English by A J Alston. This is a detailed historical study which finds that after the Advaita philosophy was formulated by Shankara and his direct pupil Sureshvara, various schools emerged with differing methods and mutually opposed views, thus loosing the firm anchorage in the Upanishads preserved by Shankara and Sureshvara. The Method of the Vedanta will be of interest to specialist scholars of technical Advaita philosophy.